When I started to paint watercolours some twenty five years ago I was confronted with the age old problem of where to begin, what to paint and where to look for inspiration. Everyone relates to the weather as it catches a moment in time we have all experienced, and this became the main theme running through my work. 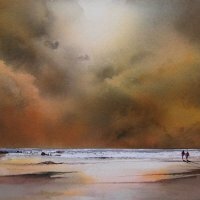 I then started to look upwards and study the sky and weather patterns, including misty scenes, and my paintings became recognised by skies whatever the subject. Weather patterns in the UK are infinitely variable and give a never ending subject matter. I have now begun to include light texture and atmosphere to my work".